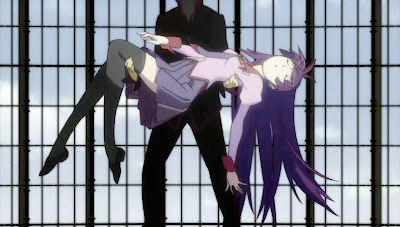 Summary: Araragi caught a girl falling, and found out she almost has no weight. He's determined to find out her secret. But at the same time, he too has his own secret. Personal comments: This is definitely the most bizarre anime I've encountered this season so far. It uses weird effects similar to Ef, mixed with creepy and conversation heavy story telling method of Mouryou no Hako, to create a feeling somewhat similar to Mononoke. This is something truely bizarre and interesting. I have watched up to 4 episodes of this anime, and i got to say i'm impressed. It is truly a bizzare story but the characters are really good in voice and behaviour. I find the main character a mix of a good spirited but dumb person, what i think to be a good combination for the story.